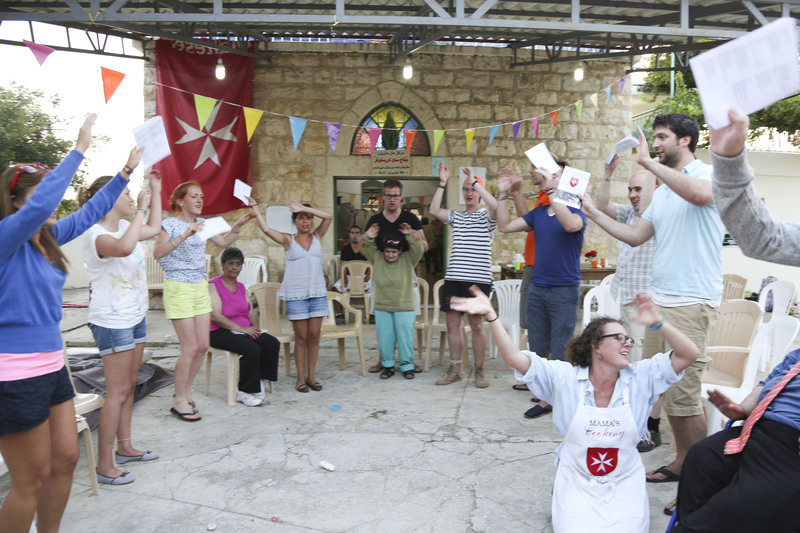 The Order of Malta Lebanon’s motto, ’I ask not about your race, nor your colour, nor your religion, but tell me, what is your suffering?’, feels particularly appropriate to the Chabrouh summer camps. This is where disabled people from all races and religions in Lebanon are cared for, loved and looked after by young volunteers from the Order of Malta Youth in Lebanon and Germany. Members of the International Fund Office had the privilege of visiting the camp in August 2012 to meet guests and volunteers, and to film the extraordinary work that goes on there. For the week of the year when they are at Chabrouh, disabled guests receive one-on-one care and attention from a young volunteer who will do whatever will make them happiest. If a guest wants to sing, dance, walk or lie down in the shade for an entire day then their assigned volunteer will join them in doing so. Volunteering is hard work, but these volunteers who come from the Order of Malta Youth in Lebanon and Germany have an extraordinary impact on the lives of those they work with. The Chabrouh camp is a place of miracles. A few years ago one of the guests fell out of a window ten metres high and was caught by a volunteer who happened to be passing by at that time. He would have died had the volunteer not been. Karim, one of the guests at the camp who lived confined in a box-like room for many years, learnt to stand up and took his first steps at Chabrouh. But the small daily miracles of the camp are the most important: feeling loved for the first time, feeling valued, feeling happy. The impact on the young volunteers is immense, the sense of fraternity and unity is palpable, and many go home to become passionate ambassadors for the humanitarian projects that are so central to the Order of Malta. Chabrouh plays host to ten summer camps each year, and hosts a total of 300 disabled guests. This covers just a small fraction of the demand from care homes and psychiatric centres, but they have ambitious plans for the future. The Lebanese association aims to expand Chabrouh to improve access and facilities for those attending the camps and increase capacity to accommodate 1500 guests annually, catering for 25% of total demand. A short film of the Chabrouh camps is available on our homepage.